The legendary Ardbeg bottlings of the 1960s and 1970s owe their existence to Hamish Scott, who transformed the way whisky was made at the Islay distillery during his tenure as manager. Scott also had an entrepreneurial streak – and introduced the world to the iconic Ardbeg ‘A’. Iain Russell tells his story. Bottlings of Ardbeg distilled in the 1960s and 1970s have achieved legendary status among collectors, and fetch huge sums at auction. They were distilled at a time when the Islay distillery was managed by the late Hamish Scott, one of the most colourful characters in its long and eventful history. Scott had amassed a wealth of experience before arriving on Islay in September 1964: he had worked at Aberfeldy, Glen Ord and BenRiach, as well as two grain whisky distilleries on the mainland, and had also made rum as the manager of the Diamond distillery in Guyana. He quickly set to work on a much-needed modernisation project at Ardbeg which was to transform the way the distillery made whisky. The new manager was shocked to discover how long it took to germinate barley at Ardbeg’s maltings. His first improvement was to heat the water used in the process and reduce the time required by more than half, to about five days. Interviewed by whisky writer Bert Bruyneel many years later, Scott recalled that the distillery had used a mix of brewers’ and distillers’ yeast before his arrival. He decided to use only the latter, as ‘the quality was always fairly consistent and gave better results’. In 1964, the worm tub serving Ardbeg’s spirit still was replaced with a condenser – the wash still’s had been replaced four years earlier. Another fundamental change in the distilling regime followed in 1966, when the stills were converted from direct coal firing to steam heating. This gave greater control over the heating of the wash and the low wines in the stills, reducing the risk of ‘scalding’ the liquid. This modernisation programme must have had a significant effect on the character of the new make distilled at Ardbeg from the mid-1960s, producing a more consistent and perhaps less ‘pungent’ spirit for maturation. Demand from blenders soared, and new warehouses were built to meet the requirements of increased production. 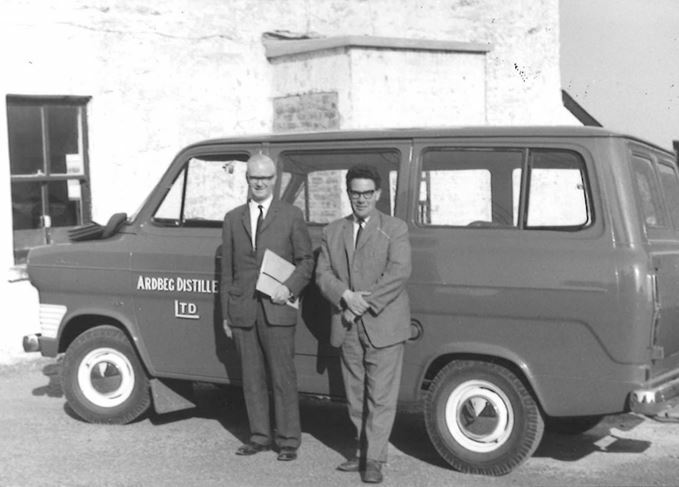 Scott was promoted to the post of general manager in 1971 by his employer, the Ardbeg Distillery Ltd, giving him greater responsibility for planning, purchasing and reporting. He was immediately tasked with increasing production to meet the growing demand for fillings. Ardbeg production was constrained by the availability of malt from the distillery’s maltings, but Scott reckoned he could buy in up to 15% of the extra malt required from the mainland, without affecting the character of the spirit. His chosen supplier was Moray Firth Malting of Inverness, which was found to be most capable of providing malt peated to the required levels. Despite his best efforts, however, the vagaries of the Islay weather helped defeat his attempts to produce a spirit of consistent character. Scott had set up a company, Islay Peat Developments (IPD), to mechanise the peat cutting process on Islay, and IPD delivered large quantities of peat to Ardbeg – such that the directors in Glasgow raised concerns about the high level of peat used in the 1972-73 season, and the resulting expense. Peating levels then fell dramatically in 1973-74, the result (according to Scott) of adverse weather conditions in which the IPD machinery could not operate. These events help to explain why some of the famous 1974 Ardbeg are far less peaty than others from the mid-1970s – something very evident in Serge Valentin’s excellent reviews of vintage Ardbegs on whiskyfun.com. Of course Scott was making Ardbeg primarily for the blending companies which dominated the whisky market at the time. While the distillery had bottled small quantities of single malt for select customers in the past, by the 1960s only a few cases were made available each year, for Islay hotels and for Christmas gifts to the directors. Scott told whisky writer Gavin Smith that he filled just a single 50-gallon cask each year for bottling as a single malt, and the casks were old. However, the whisky was immensely popular among those lucky enough to sample it, and the manager recognised another excellent business opportunity. In 1975, Scott sent a few casks of Ardbeg to Strathleven Bonded Warehouses Ltd on the mainland, to be bottled at 80 degrees proof (about 45% abv) as a single malt. He supplied the distillery’s own labels for the project, designed (with what has subsequently become the famous Ardbeg ‘A’) by an art college lecturer and professional football referee, Rollo Kyle, who was a frequent visitor to the island. Scott took the single malt to a trade exhibition in Glasgow’s Kelvin Hall, where he sold 90 cases and generated a lot of interest in the product. Sales were steady if unspectacular thereafter, although the company received an order for 50 cases from Groothandel Van Wees of the Netherlands at the beginning of 1976. A large number of miniatures were bottled for local traders that year. Venturing into single malt in this way was a bold and typically entrepreneurial initiative from the distillery manager, but Scott’s days at Ardbeg were numbered. One of the Ardbeg Distillery Ltd’s minority shareholders, the Scottish arm of the multinational distillery company Hiram Walker-Gooderham & Worts, acquired the business in early 1977. Scott later told me that he had been warned that he was unlikely to remain in his post under the new regime for longer than six months – and so it proved. After 13 years in charge at Ardbeg, with minimal interference from the mainland, Scott found it troublesome to implement the corporate rules and regulations which Hiram Walker attempted to impose. Much more serious, however, were differences over how the whisky should be made. Scott and his line manager disagreed about a dramatic fall in the quality of the spirit produced at Ardbeg in 1976/77, with Scott blaming new methods imposed from the mainland. ‘In my opinion, the deterioration in quality of the spirit is directly related to the recent changes which have been effected in the maltings,’ he reported. ‘Namely the shortening of the kilning cycle and the insufficient time allowed for the “smoking” of the malt with peat, combined with the requirement to force-dry the kiln, because of the higher moisture content of the green malt.’ He believed that quality was being sacrificed to cut costs. Scott left Ardbeg in 1977, with a new manager put in place to make Ardbeg the Hiram Walker way. Scott set up as a shopkeeper in nearby Port Ellen and later ran a bed and breakfast business near the pier with his wife. He died in 2016, and is remembered as one of the great characters in the long, rollercoaster history of the distillery: the man who made some of the greatest malt whiskies to come from the island, and who introduced the world to the iconic Ardbeg ‘A’.